The Arizona Department of Transportation (ADOT) is a multimodal transportation agency that is responsible for planning, building and operating the State Highway System and support facilities for the efficient and safe movement of people and products by surface and air. There are 22 federally recognized Indian Tribes, Communities and Native Nations in Arizona with tribal land encompassing approximately 27,736,000 acres or 28% of the State land base. 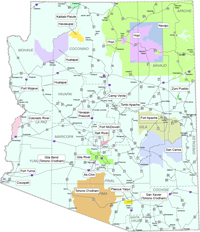 There are seven Tribes located out-of-state with aboriginal and ancestral interests in Arizona. The State Highway System includes 6,785 centerline miles of which 1,237 traverse Tribal land. There are 14 Tribal airports and five Tribal public transit systems situated within Tribal communities throughout Arizona. Both State and Tribal governments have the common goal of providing efficient transportation systems for the safety and welfare of the traveling public. ADOT’s Tribal Consultation Policy was initially adopted on September 1, 2006 and is reviewed and updated on a regular basis. It takes into consideration a 2006 Arizona Governor’s Executive Order and Federal legislative requirements for state departments of transportation to consult with Native Nations and Tribal Governments in statewide and metropolitan transportation planning processes. Additionally Section 106 of the National Historic Preservation Act requires that Tribes be consulted in any decisions affecting their historic and cultural legacy. This applies to all Tribes resident in Arizona and Tribes with aboriginal or ancestral interests in Arizona. Consultation guidelines outlined in the ADOT policy provide a basis for mutual understanding as appropriate partnerships and agreements are carried out to address State and Tribal transportation issues. With the adoption of the ADOT Tribal Consultation Policy the department is committed to work with the Tribes, Communities and Native Nations to consult and coordinate on State and Tribal transportation missions and goals. This website was developed to support those efforts and to improve State-Tribal intergovernmental relations through resource information sharing. It is designed to be a central location for state-tribal transportation partnerships, projects, activities, groups, links, and other related information. $900 Million, applications due by July 15, 2019. Funds for the FY2019 BUILD transportation grants program are to be awarded on a competitive basis for surface transportation infrastructure projects that will have a significant local or regional impact. Solicitation for proposals for implementing traffic safety programs and projects which are designated to reduce the number of traffic crashes, deaths, injuries and property damage with in these populations. Indian Highway Safety grants are reimbursable grants available for federally recognized tribes. For students pursuing an Associate, Bachelor, Master or Doctoral Degree in transportation-related disciplines in all modes of transportation, the Dwight David Eisenhower Transportation Fellowship Program (DDETFP) is now available. The High Priority grant program funds to support innovative and impactful projects that advance its mission to reduce crashes, injuries, and fatalities involving large trucks and buses. The FAST Act establishes the Nationally Significant Federal Lands and Tribal Projects (NSFLTP) program to provide funding for the construction, reconstruction, and rehabilitation of nationally-significant projects on Federal or tribal lands. How to Compete for Build Transportation Grants – Rural/Tribal Applications; Webinar Recording and presentation available online. Preparing a Benefit Cost Analysis (BCA) for a BUILD Application; Webinar Recording and presentation slides are available online. Pre-Disaster Mitigation (PDM) program makes Federal funds available to implement and sustain cost-effective measures designed to reduce the risk to individuals and property from natural hazards, while also reducing reliance on Federal Funding from future disasters.